Consider The Commons at Fallsington. A skip across the river from Trenton and a quick drive from Philadelphia, we're your escape in Bucks County. The Commons at Fallsington is in easy reach of everything. Whether it's work at Capital Hospitals or Gamesa Energy, shopping at Oxford Valley Mall, or school in Morrisville's rising Pennsbury School District, your family has a comfortable home in the center of it all. Parks, restaurants, peace and quiet -- they're waiting for you in Morrisville. 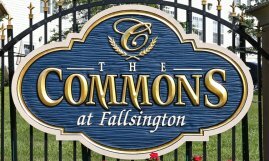 Ask us about renting apartments at The Commons at Fallsington.